Planning Applications submitted to SBC - N.B. diagrams are not to scale. Milestone Garden and Leisure planning to grow bigger and better in your Borders Milestone Garden and Leisure is getting fit and growing. Ross Allan, Managing Director is taking Milestone, an independent Scottish Borders business to a whole new level now that it is in its eighth year of trading. 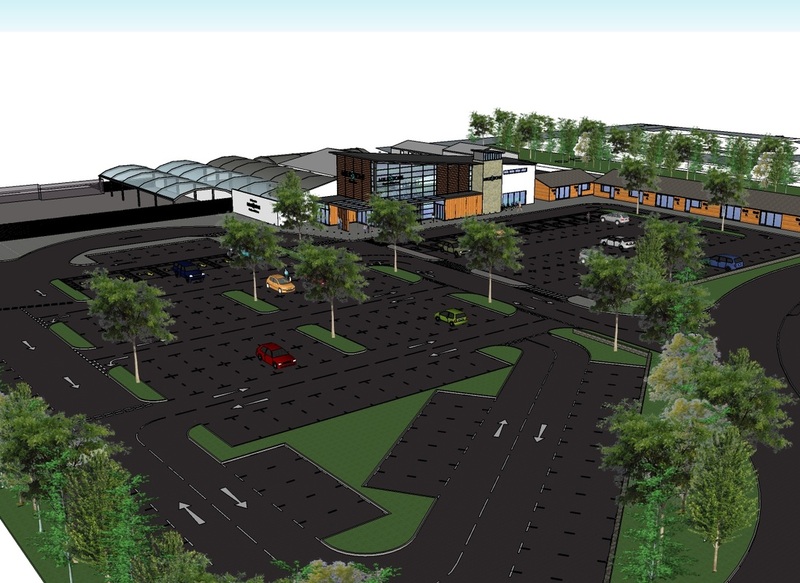 Three detailed planning applications along with drawings and landscaping plans were submitted to Scottish Borders Council last week that will allow Milestone to take the next steps in its growth plans.The applications include planning permission for 40 homes, a major expansion of Milestone Garden and Leisure to include, increased restaurant space, a new coffee lounge, fitness gym and larger garden and gift departments. 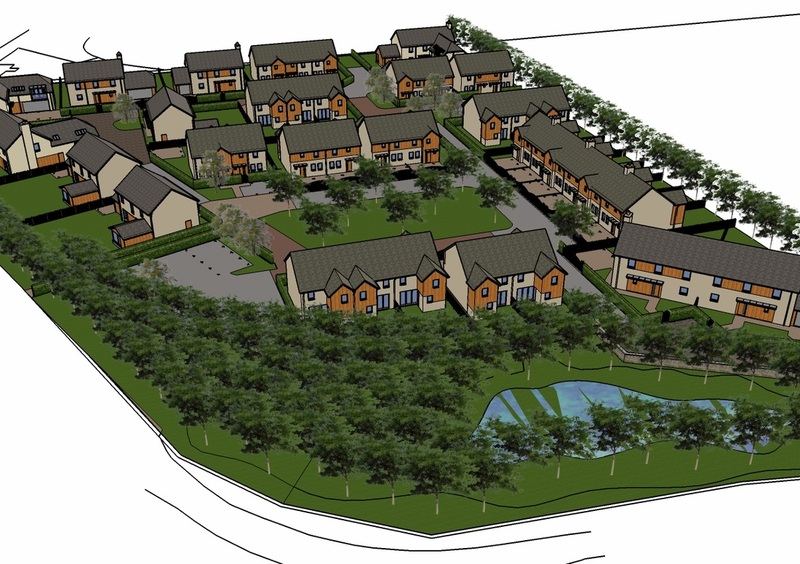 The plans also include some serviced business units on the site as well as a separate residential property. Since Milestone opened in September 2006 it has had over 3 million visitors, put in excess of £4 million pounds into the local economy, through the employment of local people and sold more than 2.5 million trees, shrubs and bedding plants. 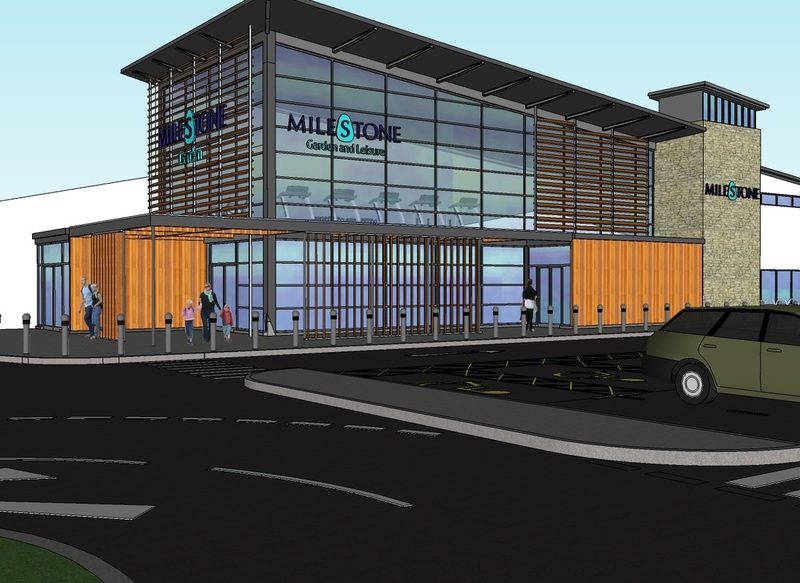 The development of Milestone will see increased employment and business opportunities as well as providing new leisure facilities for the Newtown St. Boswells, St. Boswells and Melrose area. Visitors to Milestone come from all over the Scottish Borders and Northumberland, Central Scotland and beyond. The anticipated increase in visitor numbers and footfall will benefit the local economy, local villages and the Scottish Borders as a whole. House figures are 'indicative figures' or only a guide and could change. 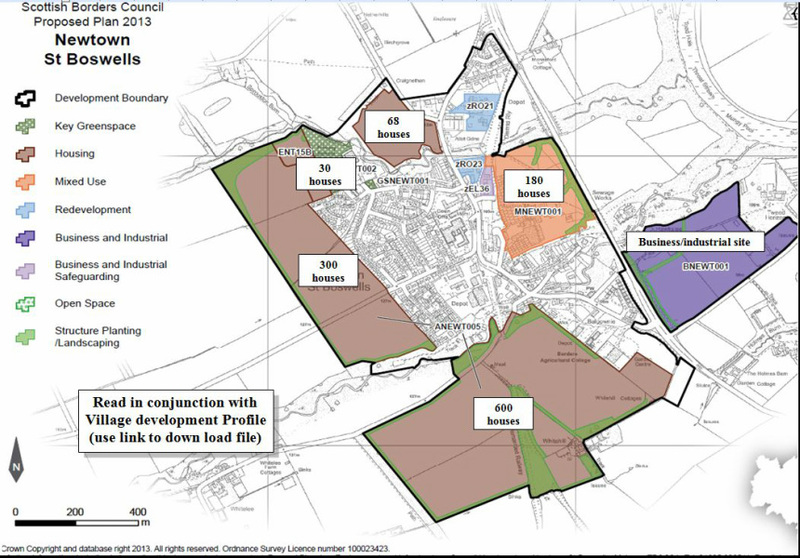 The diagram above shows the housing developments planned in the approved in SBC Local Plan originally in1995. This is now called the Local Development Plan (LDP).The large scale development involves some 1,200 houses which will quadruple the village size during the next decade to a size similar to that of Jedburgh and Eyemouth. See below links to SBC Web Site for more info. on development plans. Vol 1 - Policy Document - This is a large file with 185 pages (20MB) and depending on your computer/connection speed it will take a few minutes to download. 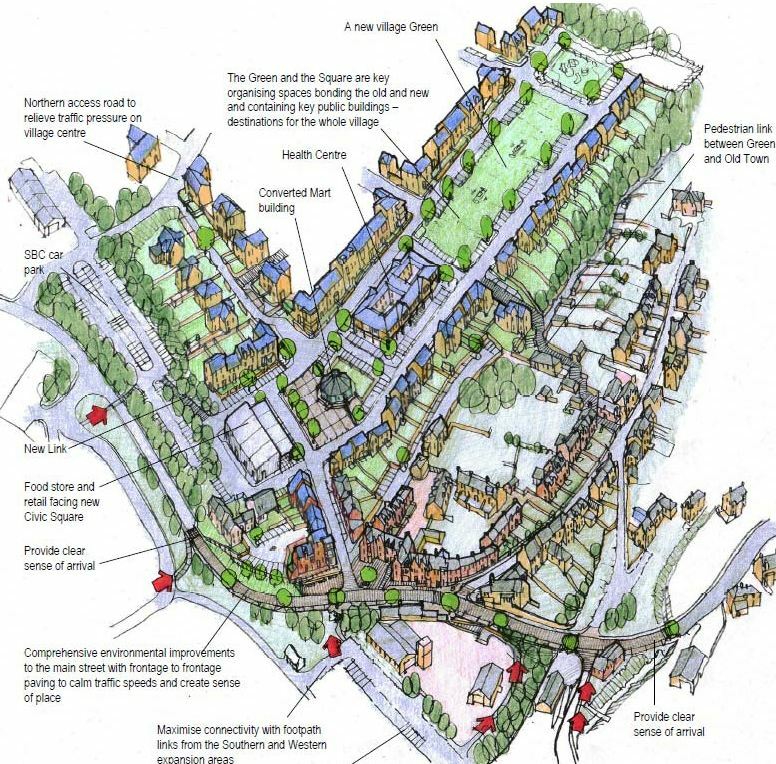 A document called the Development Framework covering Newtown has been produced by SBC which includes a new village centre layout and other details but the village is told this is only a high level document and not a firm plan, see below link. Outline planning minded to approve . Diagram below shows new village centre proposal as shown in SBC Development Framework document produced in isolation by a consultant some two years ago. Subsequent comments made by villagers have not been included. When given the last update Members of Community Council expressed dismay to hear that this would mean that the long awaited consultation would only occur with the developers and not SBC as requested many times.This would result in community consultation with developer being very constrained to items which would not involve the developer in extra costs over and above that previously agreed in the SBC 'developer contribution 'agreement. Currently the community has no idea what is being discussed or likely to be agreed ! The village has repeatedly requested discussion/real engagement with SBC on important issues such as new village centre, job creation, business development, improved community facilities, new school, car parking plans, relocation of existing businesses, main road through village local path/cycle network etc. but to no avail. Bring back life, vitality and jobs to village centre. Adequate car parking expandable as houses are built. Please give your comments. What are your priorities in a new village centre etc. etc. ?